We are a 501(c)3 non-profit organization. Our goal is to expand the accessibility and affordability of solar to all consumers and to help grow the market through education and policy advocacy. Installation companies are our partners in achieving this goal. A key metric of our success is when local contractors grow, adding staff and expanding their customer base in collaboration with our work. We believe that solar owners themselves are the strongest voices fighting for policies and regulations that promote the growth of solar. Accordingly, we not only help people go solar, but incorporate policy education and advocacy directly into our programs. Whenever possible and appropriate, we collaborate with solar installers and local industry organizations to support the industry and policies that grow the market. We regularly meet with installers to solicit their feedback on our programs and to identify policy issues that are limiting the market. If you are an installer, we want your feedback. 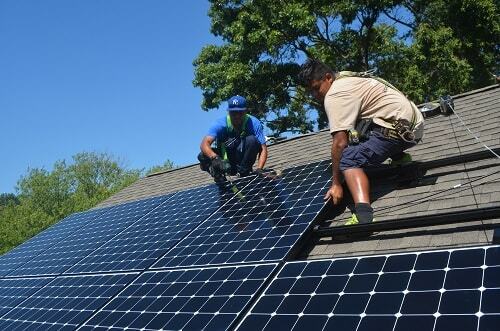 We help people go solar through two programs: solar co-ops and the solar Help Desk. In addition, we host active listservs for all types of solar supporters. Solar United Neighbors helps our members go solar on their own through our solar Help Desk. Our members receive one-on-one support throughout the entire solar process, from understanding the policies that affect installation and solar finances, to knowing what to look for when choosing an installer. The Help Desk is installer and vendor-neutral: We help our members solicit and review bids, but we do not select a company for them. A solar co-op is a group of homeowners in a defined geographic area who use their combined bulk buying power to ensure they receive the most competitive solar installations. We help each solar co-op develop and issue a request for proposals (RFP) to local installers, resulting in a competitive bidding process. We then help the co-op form a selection committee to review each bid and select the installer that best meets the needs of the group. Solar United Neighbors does due diligence on the bids, checks licenses, and collects data on companies and their customer service. We analyze the bids and give advice, as requested, to the homeowner selection committee. However, Solar United Neighbors is installer-neutral and co-op participants (not Solar United Neighbors) collectively select a single installer to service the entire group. The RFP process is open to any company that would like to bid. We do not limit the RFP to selected service providers. Solar United Neighbors is installer-neutral and solar co-op participants (not Solar United Neighbors) collectively select a single installer to service each co-op. It is important to understand that while price is important to winning an RFP, it is far from the only criterion homeowners consider when selecting an installer for their group. Homeowners also consider system quality, installer experience, strength of warranties, and local community benefits when selecting a company to service their co-op. Price is not the only criterion used when co-op participants select an installer. They also consider system quality, installer experience, strength of warranties, and local community benefits when selecting a company to service their co-op. Once a selection committee has chosen a winning installer, that company will provide the same pricing, equipment, warranties, and any additional components in all proposals issued to each co-op participant. Solar United Neighbors then follows the progress of each installation through regular communications with participants and the selected installer. Our solar co-ops bring new people into the market and create a group dynamic that encourages homeowners to “pull the trigger” and go solar. The co-ops raise awareness about solar and challenge the narrative that solar is prohibitively expensive, difficult, or complicated. We make going solar mainstream! Although each solar co-op works with only one installer, we typically see a boost in business for the entire local market surrounding our co-op. Around 20 to 30 percent of our qualified co-op participants end up going solar through their co-op. Many of the rest of the group use what they learned during the co-op process to go out and solicit proposals on their own. Combined with the buzz created by our information sessions, public outreach efforts, and the surge in local solar installations, this drives up installs for area installers who aren’t servicing the co-op. This “ripple effect” in the local market can last for several months to a year after we have finished a co-op. 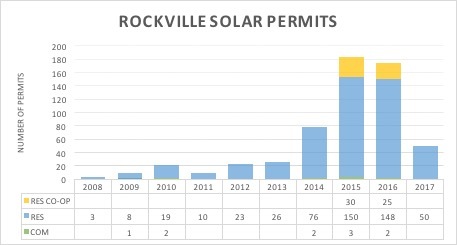 For example, Rockville, Maryland saw a spike in solar installations in 2015 and 2016 when we launched the Rockville Solar Co-op. The number of residential solar units in the county more than doubled from 2014 to 2015, with five times more non-co-op systems installed than co-op systems. In Montgomery County, Maryland, solar installations spiked after the Montgomery Solar Co-op in 2015, with five non-co-op systems installed for each co-op participant who went solar. As another example, in West Virginia Solar United Neighbors co-ops account for over 1 Megawatt of installs statewide. This is 14% of total deployed solar. 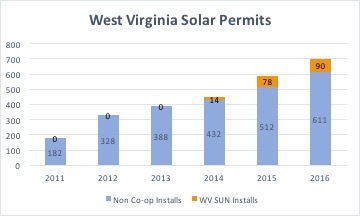 An underdeveloped and underserved solar market, West Virginia has seen one out of every six solar installations in the state installed through our co-ops. Our RFP process allows installers to refine their offerings and business models with each round of co-op. After a co-op selects its installer, we provide feedback to each company that submitted a bid, explaining what parts of their bids the co-op liked and what can be improved upon. Co-op participants complete surveys after their installations are finished, providing further customer feedback to the winning installer. The co-op experience and feedback we provide has helped companies like Sigora Solar grow from a small local installer to a fully staffed, Mid-Atlantic favorite. Upon being selected for a co-op, companies often staff up to respond to the increased demand for site visits and installs. Many continue to sustain this staff once the co-op is completed, thanks to referrals and additional demand stimulated by our co-op participants. 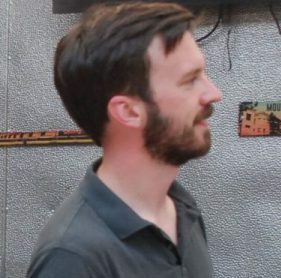 "The co-ops organized by [Solar United Neighbors] had a tremendous impact on our company. Prior to 2014, we were primarily an installation company that focused on sub-contracting work and very few sales. The co-ops opened us up to large numbers of interested homeowners, which played a large role in growing our sales department, and ultimately our company. "